On a Saturday in May of 2016, Carol Howarth, then age 65 and living in or near Haverfordwest, Wales, went to a nature preserve and likely had a pretty enjoyable day. The next day, at around noon, she went into town to grab a bite to eat and run some errands, looking to round out a relaxing weekend. Her plans were about to change, though. After doing a bit of mid-day shopping, Ms. Howarth returned to her car to find a gaggle of people staring and taking pictures of the sight below. 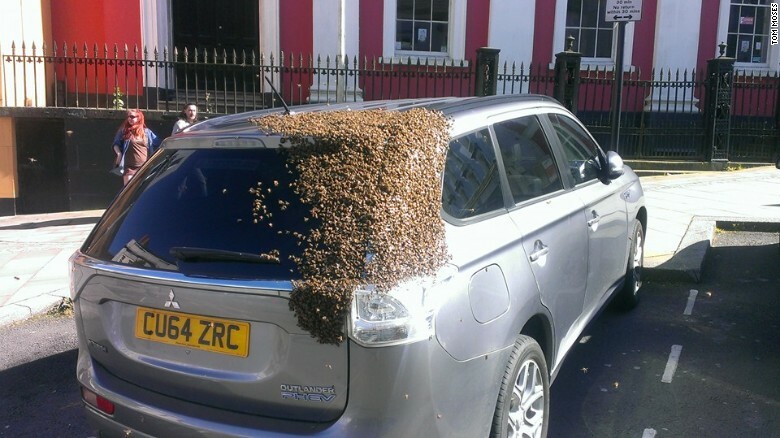 A swarm of bees — about 20,000 of them — congregated on the back of her Mitsubishi Outlander. Bees swarm when a hive has two queens, the old one and a new one. When the new one is only a week or two old, the old one will leave the hive to set up a new one elsewhere, and a large percentage (roughly half) of the bees in the old hive will follow her pheromone scent. When things go right, you get a new hive. When things go wrong — like when the queen gets trapped somewhere — the non-queen bees aren’t programmed to immediately abort the mission and find new homes. Instead, they’ll follow that queen until the scent gives out — even if it means hanging out on the back of Ms. Horwarth’s car. The problem most likely started on Saturday. While Ms. Horwath was leaving the nature preserve, a queen bee was similarly leaving her hive, looking to start a new one. But the queen, for reasons unclear, appeared to have settled on Ms. Horwath’s car as a location for her new kingdom. The swam, programmed to follow her literally anywhere, followed suit, congregating where the queen landed. That didn’t work out for the bees or, for that matter, for Ms. Horwarth. Thankfully for all involved, one of those people was Tom Moses, a local park ranger. Moses, very much aware that bee populations are dwindling, wanted to make sure that the bees were safely removed from the car for their sake as much as Ms. Howarth’s. He took the picture above (presumably more for the wow factor than for conservation purposes) and called the local beekeepers’ association which sent two of their own to help. As Moses wrote on Facebook, he was “worried that some idiot would come pour boiling water over them or something stoopid [sic]” and called in the pros. The mission to remove the bees appeared successful. Yes, the beekeepers ended up with a handful of bee stings and yes, there was a “drunk bloke from pub went and swept a load of bees off car with hand looking for queen” who also “got stung loads,” per Moses, but Ms. Howarth’s car was free of the invaders, and the beekeepers were able to coax vast majorities of the swarm safely into a box. Once a good distance from the car, the swarm was let loose again with its queen now free to roam wherever she wished. But the next morning, Ms. Horwath’s car was back home — and the bees were back with it. Somehow, the swarm had followed her around for two days, most likely in an effort to stay with their queen. Beekeeper Roger Burns, who Mr. Moses called on Sunday, offered the following explanation: “I got about 15 or 20 stings for my trouble. I then left the cardboard box on the roof while we waited for the last few hundred bees to leave the boot but then a gust of wind blew it off and the queen may have fled back to the boot again.” The drones, not knowing what else to do, managed to follow their queen even as Ms. Horwath drove her away a second time. On Monday, Burns came back out to once again clear the Outlander of its bumbling guests, and by 6 PM, he had successfully moved the swarm — queen included — off the car permanently. From the Archives: Bee Fence: Elephants vs. Bees. Guess which one wins?